On the last full day of my long weekend trip to Darwin, I rented a car and headed out to Berry Springs to visit the Territory Wildlife Park. It was only about a 45-minute drive from Darwin, but it felt like its own separate world. In the park’s aquarium, I saw a number of cool (and scary) looking fish, but these little guys are some of my favorites. This is a clownfish, or an anemonefish. They have the name anemonefish because they live on (and have symbiotic relationships with) sea anemones. (I think they get the name clownfish because they’re cute and look like they’re clowning around when they swim.) They’re found throughout the Great Barrier Reef in Australia and in many tanks and aquariums/aquaria. I took this photo at the Territory Wildlife Park in Berry Springs, Northern Territory, Australia in May 2010. © Kathy Keating and An Expat’s Photoblog, 2010. 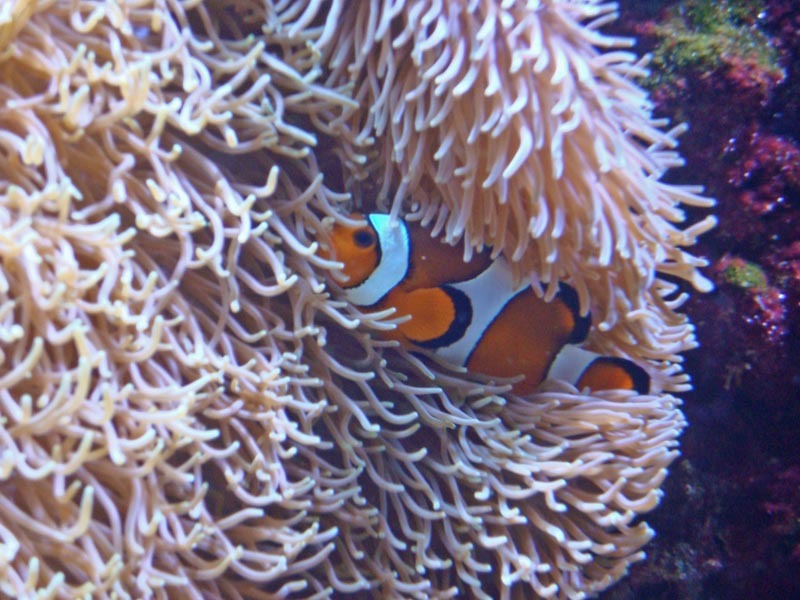 28 Aug This entry was written by Kathy Keating, posted on August 28, 2010 at 11:08 am, filed under Animals, Australia and tagged Animals, Australia, berry springs, clownfish, fish, kathy keating, northern territory, territory wildlife park, water. Bookmark the permalink. Follow any comments here with the RSS feed for this post. Both comments and trackbacks are currently closed. All content is © 2019 by Kathy Keating and An Expat's Photoblog. All rights reserved. An Expat's Photoblog is hosted by Dreamhost and powered by WordPress and Sandbox. The Autofocus theme was created by Allan Cole and modified by Kathy Keating.